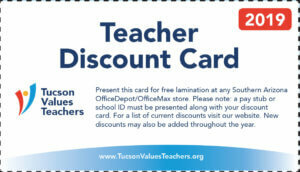 The historic Fox Tucson Theatre, in partnership with Tucson Values Teachers, wants to honor teachers by inviting you to be its guest at a show this spring by offering TWO FREE TICKETS to you for one of the following shows of your choice (up to a $150 value)! Make sure to get your tickets within the week. After that time, a $5.50 processing fee will come up with your online order, though the rest of the ticket fees will still be waived. The theatre is offering one pair of tickets per teacher, total, so choose which show it is that you’d like to attend. There are quite a number of teacher tickets for each show, but of course there are only so many seats available—so the free tickets will be offered first come, first served. To get your tickets, The Fox is asking teachers to fill out a short (3 minute) survey to help guide the theatre as it develops educational programming for you and your students. If you have any questions about this offer, feel free to contact Jordan Wiley-Hill at The Fox Tucson Theatre: Jordan@FoxTucson.com, (520) 547-7875.